These sands can be divided into distinct types. Working downwards from the surface and underneath till created by glaciers and Gault clay, one first encounters beds of Silty Sands (click to jump to section); the Red Sands; then the Silver Sands; and finally the Brown Sands at the lowest level beneath which is a Phosphate Pebble Base. Each tells us about a different episode in the story of the flood. 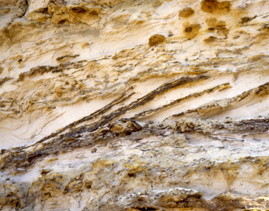 Within the bands of sand, Cross-stratification can be seen, which gives an indication of the conditions under which the sand was laid down – even the formation of Sandstone. 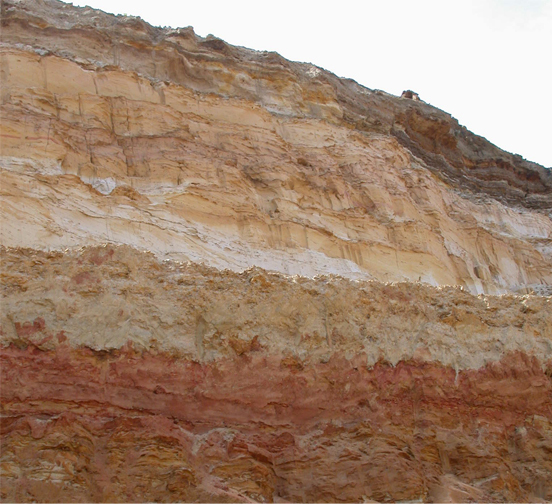 The Silty beds are found at the top of the formation. They preserve an unusual sequence of silts, sands and clays laid down in a tidal flat around the estuary. These sands mark periods when it was flooded by the sea; at other times muds and silts were left behind by river water and rain. They include pale sands laid down in fast currents as well as fine-grained organic sediments rich in fossils. The uppermost ironstone horizon contains the Shenley Limestone. The Silty Beds appear only in the Heath & Reach area. The Red Sands are the rarest sands, formed in high-energy floodwater channels that cut down into the other sands, gouging out several narrow paths. Today they can only be seen in the Billington area (Pratt’s Pit). Their alternate black (goethite-rich) laminae and pale (quartz) laminae highlight the very large-scale cross-stratification. The Red Sands are highly unusual in that they contain tiny (1mm) ooliths which look like little black balls and are made of an iron mineral called goethite. Geologists have no idea how these miniature cannon balls formed – there are still mysteries to be solved in this intriguing science. The evidence suggests these sands formed as dunes about 8m high, in channels up to 100m wide cut into the other sands by fast-moving water flowing from west to east. The Silver Sands were sand bars forming at the mouth of this estuary. The Silver Sands are almost pure quartz sands that may be many colours, from pale cream and tan to dark orange. When the iron oxide that holds them together is washed away, the sand grains include clear, quartz, yellow citrine, and mauve amethyst. They are full of fossil wood brought down by the river from cycad forests growing on higher ground. 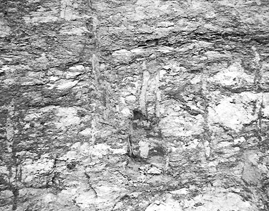 Fossil charcoal tells us that fires sometimes raged in the forests. Whilst fossil wood is abundant, there are very few other fossils; fast-moving currents moved the coarse-grained sands too quickly for animals to settle in the dunes, and the shells of any that did would have dissolved long ago in the water running through these porous sands. Silver Sands are the most commercially valuable of the sands. They are used in many industries ranging from water filtration and foundries to golf courses (the horticultural grade is exported to Saudi Arabia). The Silver Sands can be seen in many quarries including Munday’s Hill and Stone Lane. The Brown Sands are the oldest, at the bottom of the formation and were laid down in the seaward end of an estuary. 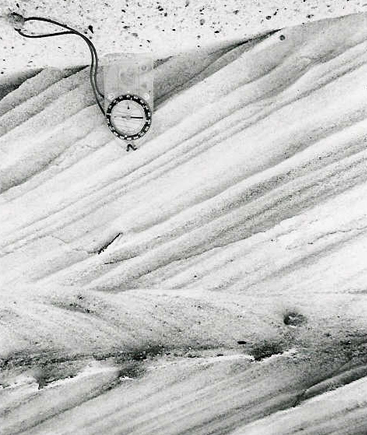 The most notable feature of the Brown Sands is the thin (c. 20cm) beds that show distinctive bidirectional (herringbone) cross-stratification (see 7 below). 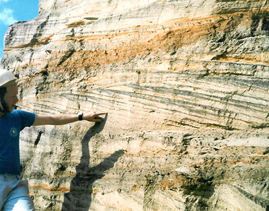 This, and well-developed ripples are highlighted by clay drapes, which show the ‘tidal bundles’ formed during the spring-neap tidal cycles over a Cretaceous fortnight. These are exceptional – where else could you see 14 days of history formed 115 million years ago! Fresh and brackish water algae survive as fossils to be found with a microscope! They are strongly iron-stained and full of the burrows of shrimp and other animals, which stick out of the sand face like tiny drain pipes, preserved by an inner coating of hard ironstone. These sands can be seen best in Nine Acres Quarry, but Munday’s Hill and Stone Lane Quarries are impressive. The Brown Sands appear across Bedfordshire, but are seen at their best in the Heath & Reach area. Beige in colour, they are fine-grained with quartz grains (pale), many mica flakes (silvery and shiny) and occasional black rock fragments. The Brown Sands of Stone Lane Quarry are beautifully patterned by iron-rich minerals moving through the sands. 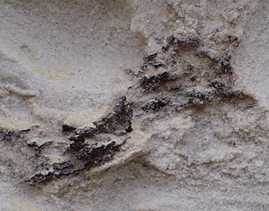 Seams of Fuller’s Earth (reworked ash from a volcanic eruption) are found in the middle of the Brown Sands. The phosphate pebble bed found at the base of the Lower Greensand from Great Brickhill (Bucks) to Potton (Beds) and Upware (Cambs). They are evidence of an early pulse of the sea-level rise that eventually flooded this region. 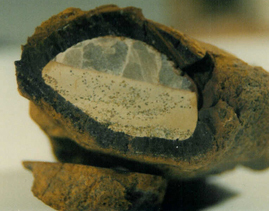 These reworked phosphatised marine fossils were one of the ‘coprolite’ beds exploited for fertiliser production during the late 1800s to early 1900s. 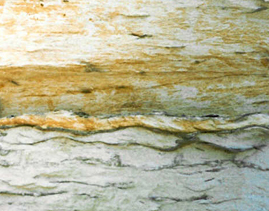 The cross-stratification was created by layers of sand cascading down the slip face of the dunes. The pattern of layers – parallel or intersecting – tell us about the shape and size of the dunes, and whether they were being built or eroded as the shifting currents took the sands away. There are few if any signs of animals living in the dunes here, probably because the sand was moving too quickly in the tides and currents. Stone Lane Quarry (Picture 4.1.a) has created one of the best cross-sections you will see through the Lower Greensand, including the Silty Beds and the Brown Sands. By chance this quarry has revealed a deep channel cut through the Gault that overlies the Greensand. The channel is filled by till created by the grinding action of ice on rock as a glacier passed over this part of Bedfordshire half a million years ago. Until World War Two, a full-time worker cut the sandstone blocks that can be seen in many buildings in Leighton-Linslade and Heath & Reach.